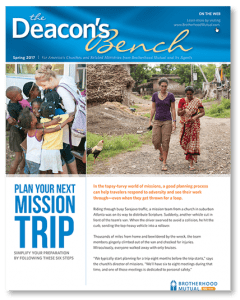 Preparing travelers for mission trips can help them avoid dangerous situations, and respond efficiently when things turn dicey. This edition includes tips that can help ministries cover their bases before, during, and after their travels. Safeguard Your Valuables: How to travel safely with money and valuables. After the Trip: Help travelers grow by reflecting on their mission trips. An Act of Worship: A Brotherhood Mutual employee looks back on his missionary days.